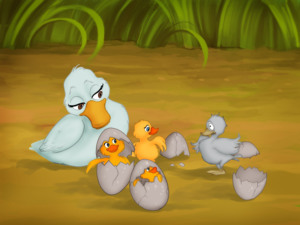 One hot summer's day a mother duck's eggs began to crack and hatch and little ducklings started appearing through the shells one after another. "Cheep cheep," they cried. 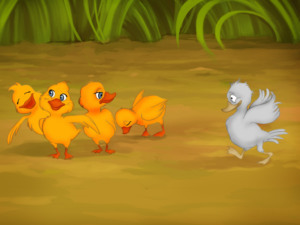 But one of the ducklings was different. This little duckling was very cheerful and would happily join in every game his sisters and brothers were playing. But sadly they didn't want to play with him. 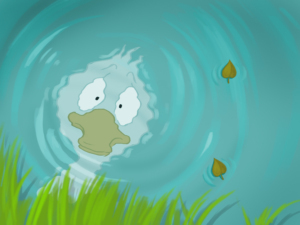 He couldn't understand why no one liked him, until one day he saw his reflection in the water. "I am so ugly! 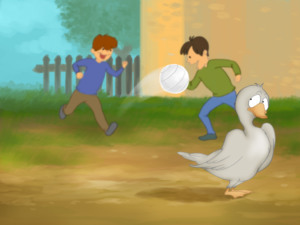 That's why no one likes me," the duckling thought and decided to run away from home. He left his home and set out. On his way he stumbled across a woman, who took him home and fed him. 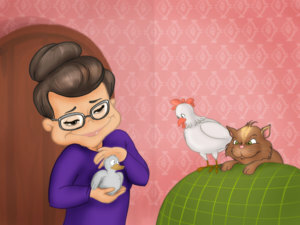 But her cat and her hen treated the duckling very badly, so he left the woman’s house. Winter came and the duckling was all alone and freezing cold, when a man saw him and took him home. 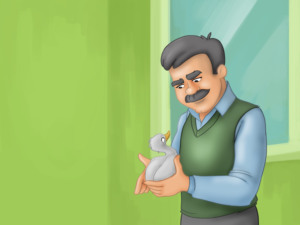 The man treated him well, but his children terrified the duckling. They would run and jump and shout all over the place, so he escaped. At last, spring arrived and the duckling was so happy that he could swim again. 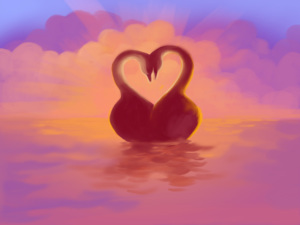 One day, as he was swimming, he saw a beautiful swan in the lake and fell in love instantly. 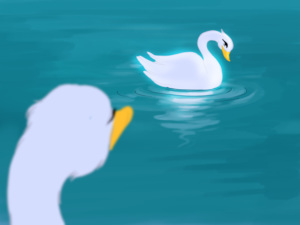 However, the duckling remembered that he was very ugly and at this thought he bowed his head down in sadness. But what did he see in his reflection? Over the winter he had turned into a very handsome young swan! "I understand now! 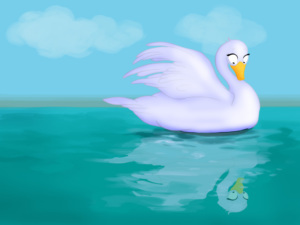 My brothers and sisters are all ducklings, but I am a swan," he thought and swam after the beautiful swan. Soon they got married and lived happily ever after.